Remind them to increase their visibility at night by carrying a flashlight when walking and wearing retro-reflective clothing. 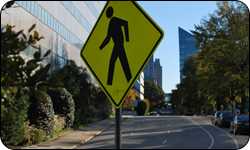 Encourage them to always walk on sidewalks or paths, cross the streets at street corners, and always follow traffic signals and crosswalks. Remind them to always look left, then right, then left again before crossing the street. Parents and caregivers should model the behavior they would like to see. Talk to them about staying alert at all times and to not be distracted by cell phones or other digital devices while walking. Remind them to be attentive for cars that are backing out of or pulling into driveways or parking lots.